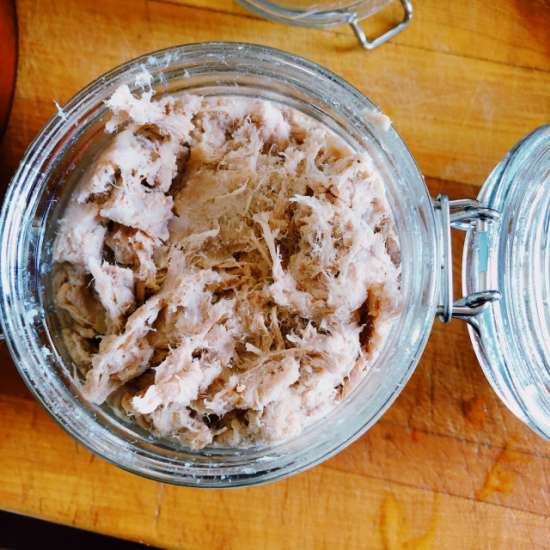 Rillettes is about as old-school a dish as you can get – and a tragically hard-to-find one. It gets right to the heart of what’s good: pork, pork fat, salt, and pepper. Kick off a meal with rillettes and you don’t have to wipe the plate rims, garnish the entree, or remember to keep your elbows off the table. Rillettes is something you serve friends – and people you already know you like. I miss Anthony Bourdain already. He was my kind of cook, and he cooked my kind of food – big, gutsy, quietly sophisticated, a generous nod to tradition and never, ever, ever straying far from the very central point of cooking and eating. Flavour is everything, and it has to taste good. I found Kitchen Confidential explosive, a glimpse into another world, written by a man who struck me as a punk, poet, and artisan rolled into one. It felt dangerous and authentic, raw and unfiltered. It still does. It still has a power to grab me and to drag me into all those many American kitchens. Bourdain’s Les Halles Cookbook has featured proudly on my shelves for a long time. I use it often. It’s a go-to for French cooking, full of authentic recipes written with care and love, the chef’s methods, techniques and sometimes, short-cuts thrown in for good measure. I’ve taken it from its shelf this week, sadly and defiantly, and I’ve re-read large parts of it. Bourdain wrote like a prince, his turn of phrase was elegant and at times beautiful. His death came too soon, and it’s a great loss, but his work remains, and I’m grateful for that, because it’s genuine, authentic and it has more clout than all of those bad boy celebrity chefs rolled into one. Bourdain was the real deal. Never forget that. This is a simple dish, but one that needs some care and attention. Cook it well, and it will reward you with three or four Kilner jars full of smooth and silky seasoned pork and fat that will happily sit in the fridge for at least a month. What better thing could a person have in their fridge than a jar of Tony Bourdain’s rillettes? Slice the skin off a 900g slab of pork belly, and also from a 450g chunk of pork shoulder. Keep the skin, and toss it into the bottom of the oven next time it’s on, seasoned enthusiastically with salt and slashed with a razor. You won’t regret doing that. Cut the meat into two and a half centimetre square pieces and put them in a large, heavy pan, along with a bouquet garni made from celery, bay leaves, flat leaved parsley and some thyme, tied together in a square of muslin, and 900ml of water. Bring the pot up to a low, slow simmer and cook for around six hours, stirring occasionally. The meat will be very tender, and should fall apart at the touch of a fork. Fish the meat out from the broth, and let cool until it’s possible to handle it. Tear the pork apart with a couple of forks, ripping the fibres apart rather than mashing them up, in much the same way you’d make pulled pork. Bourdain warns against turning the pork into a mush, and he’s right … rillettes demand some texture and body, and it’s for this reason that any alternative recipes that call for the use of a food processor should be soundly ignored. Season the shredded pork with a teaspoon or more of salt and a good grinding of black pepper, to taste, and finding the right seasoning point is hard, because once tasted, it’s kinda hard to stop tasting. Warm shredded pork is one of the good things in life. At this point, it might be necessary to adjust the texture a little, and there are a couple of tricks for this. A splash of the cooking broth will be greedily sucked up by the resting pork, and if it was on the lean side to start with, some melted pork back fat would be in order to loosen it up and bump up the fat content. When the texture is just right, pack the meat into Kilner jars. Bourdain tops each jar with slices of pork back fat, but I decided to melt the fat and pour it over, as for a pâté, which created an air tight seal. Leave the closed jars in the fridge for at least three days, and then serve lazily piled into the middle of a plate, surrounded by bread and cornichons.